SKY MAP: The sky as seen at 10 pm local time on June 15 from midnorthern latitudes. Last week we spoke of a large, nearly equilateral triangle of stars which some refer to as the "Spring Triangle." This week we're going to take a closer look at the brightest luminary in the Triangle: Arcturus in the constellation of Boötes, the Herdsman. Arcturus is an unmistakable object in our late-spring evening sky. This week, Northern Hemisphere observers will see it sparkling with a golden yellow or topaz hue, soaring high in the southern sky as darkness is falling. Arcturus ranks as the fourth brightest star in the night sky overall, behind Sirius, Canopus and Alpha Centauri. In some older astronomy books, it is actually ranked sixth behind Vega and Capella, but modern measurements have shown it to be a trifle brighter than those two stars. As if it weren't already easy enough to find, there is another way of locating it. Simply remember the following mnemonic phrase: "Follow the arc to Arcturus." 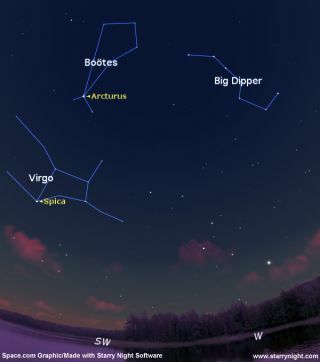 That means just this: look at the Big Dipper. Its handle is bent. Imagine extending a curve from the handle; a curve that is readily translated into a smooth arc. Continue that imaginary arc about the length of the Big Dipper and you will ultimately come to Arcturus. Some folks may add an additional line: "then speed to Spica," for that same arc, continued past Arcturus for roughly the same distance, will come to the bright bluish star Spica, the second brightest star in the Spring Triangle. Arcturus has been estimated to be roughly 25 times the diameter of the sun -- about 20 million miles. Its luminosity is about 115 times that of the Sun. In his definitive three volume work "Burnham's Celestial Handbook," Robert Burnham, Jr. (1931-1993) pointed out that with modern infrared recording devices, the heat received from Arcturus has been measured, and was found to "equal the heat of a single candle at a distance of about 5 miles." It was 74 years ago, on May 27, 1933, that Arcturus became the object of a great publicity build-up in Chicago, at the opening of the Century of Progress Exposition. At 9:15 p.m. Central time that night, the star's light was focused by telescopes on photoelectric cells, and the current generated was used to activate the switch to turn on the floodlights at the exposition grounds. Arcturus was chosen for this task because Chicago had a great World's Fair in 1893. The best estimates at that time said that the light from Arcturus required 40 years to reach Earth. So a story was built around the fact that the 1933 fair would be opened by light that had started its trip while the 1893 fair was still in progress. Our more accurate measurements today, however, place the light-time distance of Arcturus at 37 years. So it was really starlight from 1896 that turned on the lights of the 1933 fair. Another interesting fact about Arcturus is that it appears to shift its "fixed" position in the sky much more rapidly than most of the other bright stars. Edmund Halley was the first to discover this motion back in 1718. Arcturus appears to whizzing through space at a speed of nearly 90 miles per second in the direction of the constellation Virgo. It appears to move toward Virgo by about one-degree (which is about twice the apparent width of a full Moon) over a time span of about 1500 years. We are thus very fortunate to live at a time when the distance separating Arcturus and our solar system is nearly at its minimum. It will continue to approach the Earth for several thousand years more, but then it will pass us as it continues to move toward Virgo and its distance from us will begin to steadily increase. Computations show that in approximately 500,000 years, it will probably have moved out as far as 800 light years away from us and likely will have faded completely from naked-eye visibility.